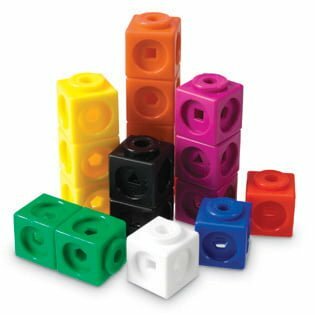 High-quality plastic cubes measure ¾” each and come in 10 bright colors. These stackable cubes are easy for little hands to connect and twist apart. Great for counting to 100 by ones and tens, grouping, and one-to-one correspondence. MathLink® Cubes feature geometric shape cutouts. Cubes link together on all sides of each cube with geometric shape cutouts for more complex patterning activities.